6-CD box (LP-size) with 66-page book, 152 tracks. Playing time approx. 402 mns. Ten Gallon Boogie, Jukebox Blues, Bull Fiddle Boogie, Birmingham Bounce, Plantation Boogie, and even the first cover version of Blue Suede Shoes. All told, there are 151 songs cut for RCA and Bullet between 1946 and 1958. Nothing swung harder than the Golden West Cowboys! After suffering a heart-attack on February 28, Pee Wee King died March 7, 2000 at age 86. 01 Going Back To A.L.A. 13 Why Don't You All Go Home? 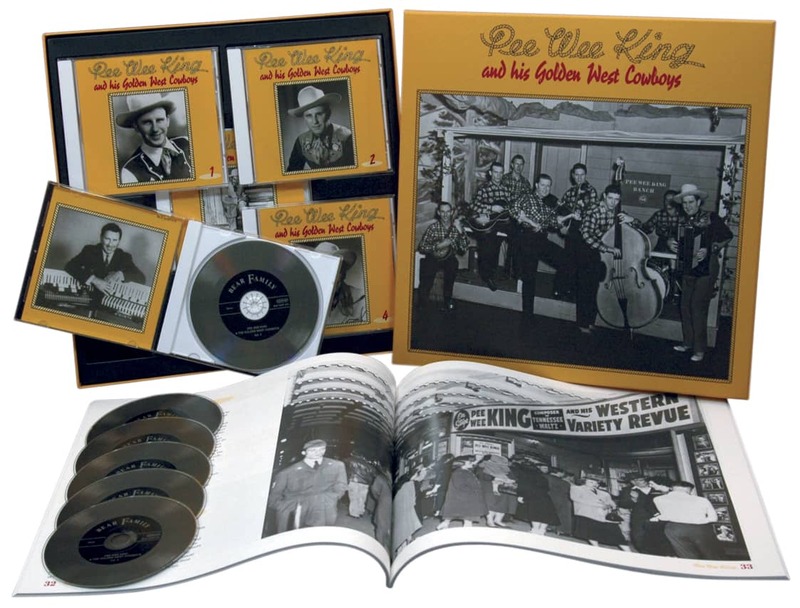 As an instrumentalist, bandleader, actor, songwriter, and businessman, Pee Wee King had a long and varied career. Born Julius Frank Kuczynski in 1914 in Wisconsin, he learned concertina, fiddle and accordion while playing in his father's polka band. After graduation, while fronting his own band, he met Gene Autry; the future cowboy star was hosting his own program on Chicago's WLS and offered King an opportunity to back him. By 1934, Autry and King moved to WHAS Louisville, but after less than a year, Autry departed for Hollywood. 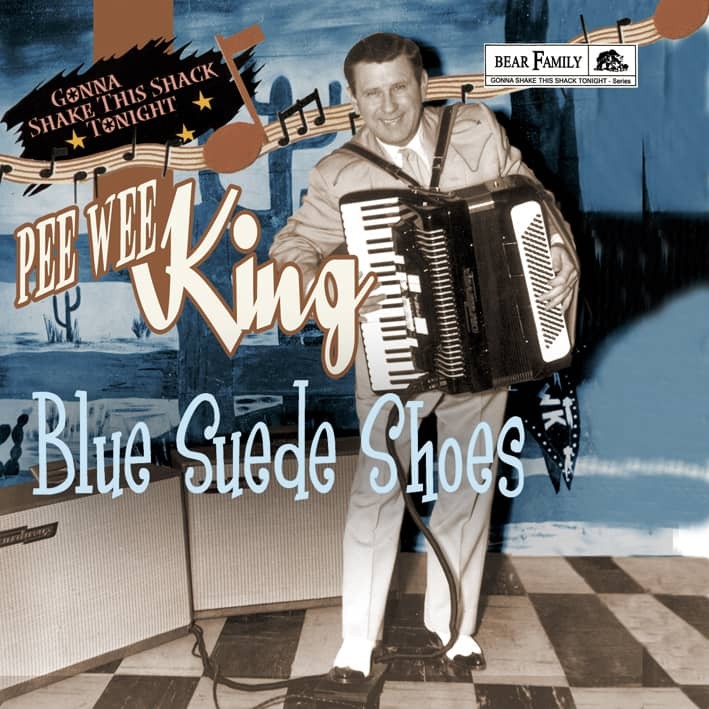 Opting to stay with country music, Pee Wee changed his name to 'King' in honor of polka favorite Wayne King. 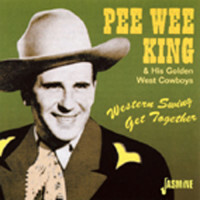 After a year spent with Frankie More's Log Cabin Boys, Pee Wee formed his own Golden West Cowboys with vocalist Texas Daisy, fiddler Abner Sims and guitarist Curly Rhodes. He ran a tight ship, organizing arrangements and intricate stage shows which promoted the band well around the Louisville area. By 1937, the Golden West Cowboys had accepted a spot on the Grand Ole Opry. 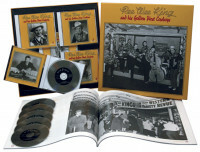 Though the band failed to chart after 1954, King continued to lead the Golden West Cowboys until 1969, when he retired to work on the business side of country. A past director of the Country Music Foundation, Pee Wee King was inducted into both the Nashville Songwriters Hall of Fame and, in 1974, the Country Music Hall of Fame. 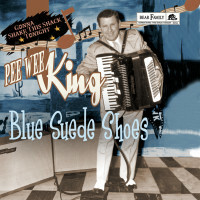 After suffering a heart-attack on February 28, Pee Wee King died March 7, 2000 at age 86. He was a short, funny, good-hearted man who would come to his record store (King's Record Shop...pictured on the front of a Rosanne Cash LP), hang out with friends, and tell stories. His complete recordings from 1946 to 1958 are available on our anthology below that includes his most exciting swing and rock 'n' roll recordings. The Saturday evening of April 14, 1945 posed a problem at the Grand Ole Opry. The nation was in mourning for President Franklin D. Roosevelt's sudden death two days earlier. WSM announced that the Opry itself had been cancelled for that week but left the Ryman Auditorium open for people who didn't hear the announcements and, in the Opry's place, offered a short program. The always-reliable Pee Wee King and his Golden West Cowboys, were in the house, previously scheduled to fill in for Roy Acuff on the half-hour Prince Albert Tobacco segment. Hay asked Pee Wee to play his regular stage show, unaware that it differed radically from King's usual Opry spots. Hay's artlessly crafted façade of rural purity for the Opry barred the urbane sounds of drums and horns. It even took him time to accept Pee Wee's accordion, much less the electric guitars that became part of the show in the early 1940s. Late in '44, Opry guests Bob Wills and his Texas Playboys flipped off the show's no-drums rule. To obey Hay's 'down to earth' dictums, Golden West Cowboys drummer Sticks McDonald and trumpeter Buddy Harrell weren't using their usual instruments at the Opry. The Cowboys began with their own FDR homage. Harrell played Taps, followed by Pee Wee's solo accordion rendition of My Buddy. Then the band ripped into a blazing version of the swing favorite Bugle Call Rag that, with Harrell and McDonald roaring away, kept the energy high. It delighted the Ryman audience. Flustered and upset, when Hay confronted Pee Wee afterward, the bandleader laconically reminded Hay that he'd specifically requested they play their stage show. It's easy, given the similar instrumental lineups, to lump King and the Golden West Cowboys with Wills and other Western swing groups. It's also a flawed, apples-oranges equation. Wills and the Playboys were dancehall denizens, Pee Wee and company an all-purpose Western show band able to satisfy dancers but playing mainly to sit-down audiences. Radio and TV were their primary outlets along with theaters, auditoriums, fairs and parks, where they offered an amalgam of cowboy tunes, polkas, parlor tunes, boogies, swing, novelties and current pop hits that could please any crowd—even listeners who loathed country music. These bands were ubiquitous both before and after World War II in Midwestern and Eastern cities large and small. New York City had Denver Darling; Captain Stubby and the Buccaneers owned Chicago. The Down Homers worked out of Fort Wayne, Indiana. In Washington D.C., Jimmy Dean and his Texas Wildcats became a local institution. Slim Rhodes dominated Memphis. Sunshine Sue and her Rangers held forth at WRVA in Richmond. Indiana. Pittsburgh, Pennsylvania, Slim Bryant and his Wildcats were stars; Chester, Pennsylvania, near Philadelphia, had Bill Haley and the Saddlemen. Philly itself was home to Jesse Rodgers and the Border Riders. Pee Wee began in the Midwest, born Julius Frank Anthony Kuczynski in Milwaukee in 1914. He grew up there, spending summers on relatives' farms. His father John, who played concertina and violin, led a polka band called the Midnight Four. Frankie began accordion lessons in 1929, learning the instrument despite his disdain for formal study. When he met nationally-known sweet bandleader Wayne King in 1930 and explained he was an aspiring musician, King suggested the kid adopt the easily remembered surname of King. His new country-polka group the King's Jesters played the 'Badger State Barn Dance,' inspired by Chicago's WLS 'National Barn Dance,' as well as the Polish-American Hour over WJRN in Racine. In 1934, 'National Barn Dance' star Gene Autry and band the Range Riders toured Wisconsin with manager Joe L. Frank when they wound up in a car crash. With several Range Riders injured, Frank heard the King's Jesters on a radio as the cars were being serviced and made contact. The Jesters played one show with Autry, who then temporarily hired King to finish the tour with the Range Riders and dubbed Frankie King 'Pee Wee.' He returned home, but within months Frank invited him to Louisville, where Autry was working at WHAS radio. In June, 1935 Pee Wee became Autry's regular accordionist while the cowboy singer awaited his call to Hollywood. Pee Wee stayed in Louisville when Autry left to launch his film career. Frank moved him into a new band called the Log Cabin Boys, who did extensive radio and personal appearance work around Kentucky before spending 1936 at WNOX in Knoxville on the station's 'Mid-Day Merry Go Round' show. Pee Wee became engaged to Frank's daughter Lydia during that time, and married her late that year. He and Frank, his music business mentor, planned their next move as 1936 ended. Early in 1937, back in Louisville at WAVE radio, Pee Wee unveiled a new band. In tribute to the popular Girls of the Golden West, they were called J. L. Frank's Golden West Cowboys. Frank had enough influence to get the Cowboys an Opry audition, their professionalism and polish impressing WSM officials. The group joined the cast in June, 1937. Unlike other Opry acts, the Cowboys were union musicians and insisted they be paid accordingly. Pee Wee and J. L. Frank were a team, creating slick show promotion packages including flashy posters. 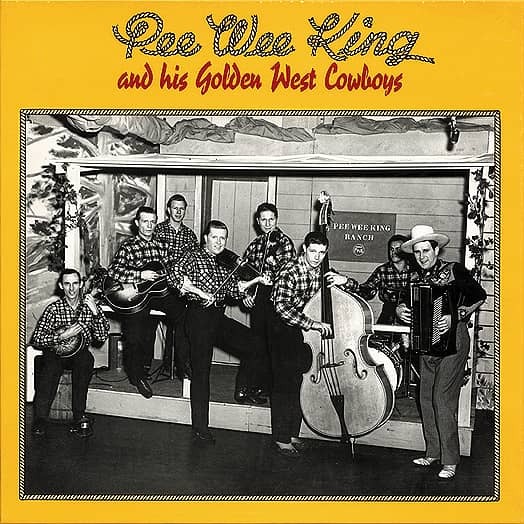 In 1938 Frank took his name off and the band became Pee Wee King and the Golden West Cowboys. Playing a show in St. Louis, King was impressed by local vocalist Eddy Arnold and hired him as the Cowboys' vocalist. Customer evaluation for "& His Golden West Cowboys (6-CD)"
One of THE BEST CD collections out there. The photo book is an excellent addition to the whole set! A must have!